Alec Baldwin, pictured in a Feb. 2017 opening sketch of "Saturday Night Live," returns to the late-night show Saturday to mock the president’s national emergency. 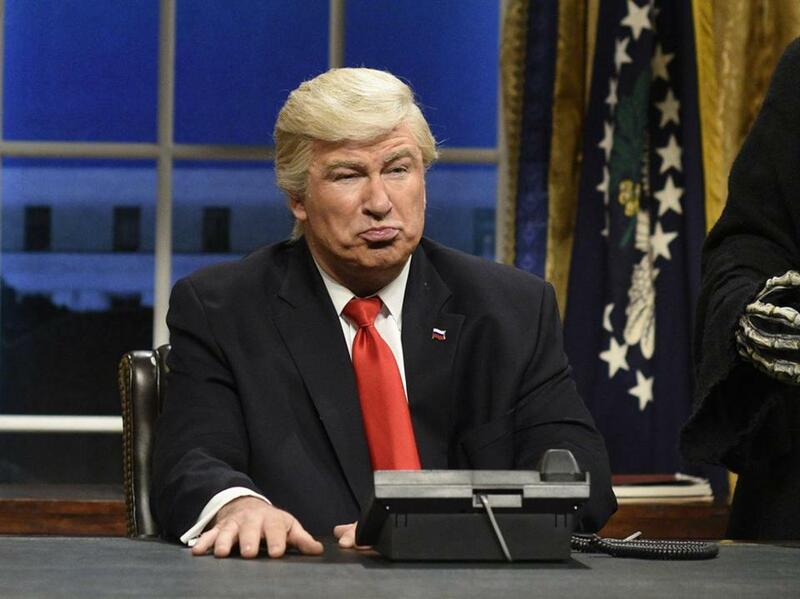 Alec Baldwin again skewered President Trump on “Saturday Night Live,” in the Feb. 16 cold open to address recent White House developments in a skit that drew a rebuke from President Trump himself. In between stereotypical impressions of Chinese President Xi and New York Senator Chuck Schumer, part of a jab at how winding the president’s remarks were Friday morning, Trump took a few “softball questions” from reporters, including CNN’s Jim Acosta, played by Kyle Mooney, with whom he has repeatedly clashed (Trump did so again earlier this week during his real announcement). In a Sunday morning tweetstorm, the president blasted the episode, describing it as a coordinated attack. “Nothing funny about tired Saturday Night Live on Fake News NBC! Question is, how do the Networks get away with these total Republican hit jobs without retribution? Likewise for many other shows? Very unfair and should be looked into. This is the real Collusion!” Trump tweeted. You can view the whole cold open above.